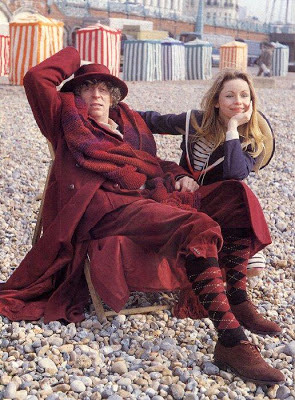 We first get to see the new costume in the opening scene, where The Doctor is asleep in a deck chair on Brighton beach (see below, top). 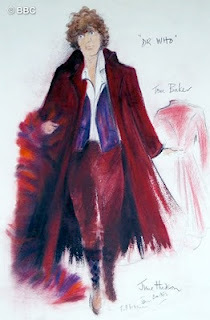 The main part of the costume of a massive calf-length plum-coloured greatcoat. The coat is fully double breasted and unlike all his previous frock coats, is broad enough to button up. The publicity photographs taken on location reveal the lining to be a plain matching burgundy. However, by the time of the studio filming a black and emerald checked lining had been installed (see left, second picture). Over the greatcoat he wears a new scarf, knitted in terracotta, burgundy, and plum chenille with double striped borders at each join. 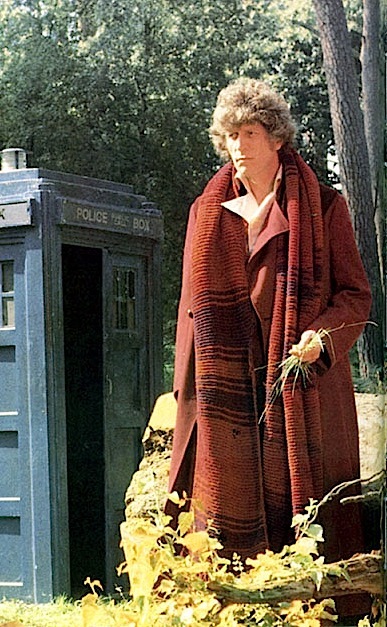 It ends up being the longest scarf the Fourth Doctor ever has. His new shirt is ivory coloured and has a large pointed collar and lapels, on which are embroidered two subtle question marks. The other parts of his new outfit include matching burgundy corduroy breeches; black and burgundy argyle socks; brown suede full-brogue shoes; a fancy new waistcoat in swirling burgundy and gold pattern; and a burgundy fur felt fedora with a notably narrower brim. This first serial is the only time the ENTIRE costume is worn in full. The fedora hat only appears in this story, and is not seen again. Another item worn exclusively on the costume’s debut is a full-Norfolk jacket in burgundy corduroy, matching the breeches. 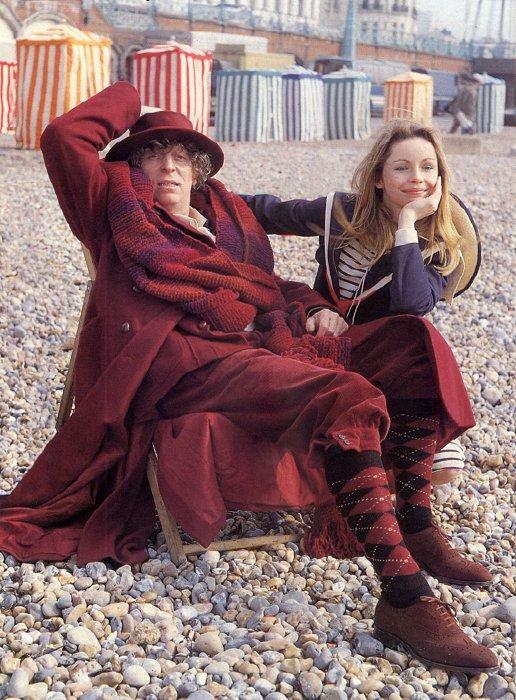 It can be seen under the coat on Brighton beach and is revealed when The Doctor removes his greatcoat, scarf and hat in the latter scenes of episode one. The jacket has brown leather-football buttons; it is pleated on the back; patch pockets at the waist; is yolked front and back; and has the classic strapped front and full integral belt. 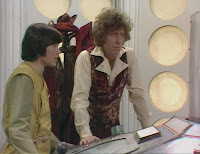 It is based an a design of jacket introduced during Edwardian times, and is not dissimilar to one worn by Lawrence Scarman is in Pyramids of Mars. After this serial, it is never worn nor seen again. June Hudson included the jacket as part of the costume to give a lighter weight options for actions scenes if required. This never came about and the jacket was not worn again. The brand new burgundy fur felt fedora also never made it past this first serial. 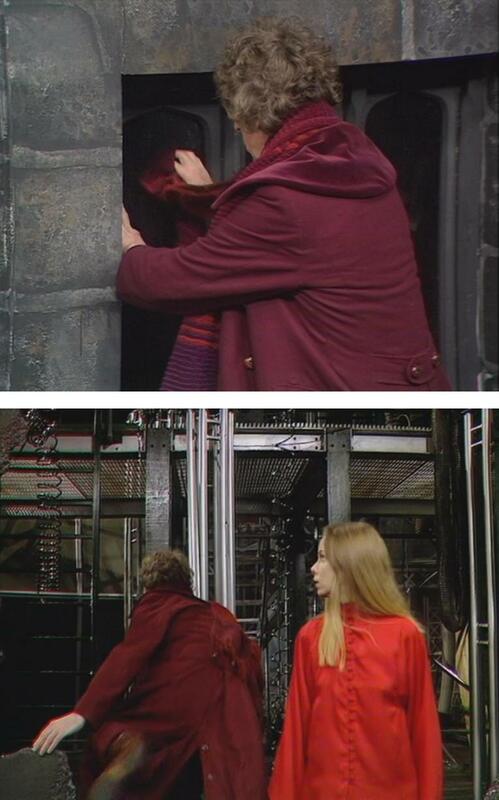 When The Doctor puts his greatcoat back on the in episode two, he doesn’t regain the scarf until much later, so we get to see the enormous velvet collar on the coat. He wears the hat one final time for the latter half of episode four. The serial opens with The Doctor repairing K-9. He is seen the same rubber apron worn two seasons back in The Armageddon Factor (see left, top). This is over his waistcoat and shirt, giving us our first decent look at these two new additions to his wardrobe (see left, second picture). The waistcoat is velvet with a swirling leaf or petal design in burgundy, violet and gold; it has shawl lapels; four welted pockets; and a burgundy satin back with an undone half belt. He wears it unbuttoned, as is now usual. The shirt, with its pointed collar and lapels that mimic the arrangement on his greatcoat, is in an ivory colour like a lot of his other shirts; the lapels have question marks embroidered on them; and three-button cuffs are worn with only the middle button done up (see left, bottom). On the hatstand is the rest of his new costume: the plum coat, chenille scarf and fur felt fedora hat (see left, top). He also continues to wear the corduroy breeches, argyle socks, and suede brogue shoes, but does not wearing the greatcoat and scarf until halfway through episode two. We get a few glimpses of his braces, which appear to be narrow burgundy clip-on braces with silver ends, not unlike the ones the Eleventh Doctor wore in his first two series (see right). As you can see, we also get a nice look at the emerald green and black checked lining inside the greatcoat. 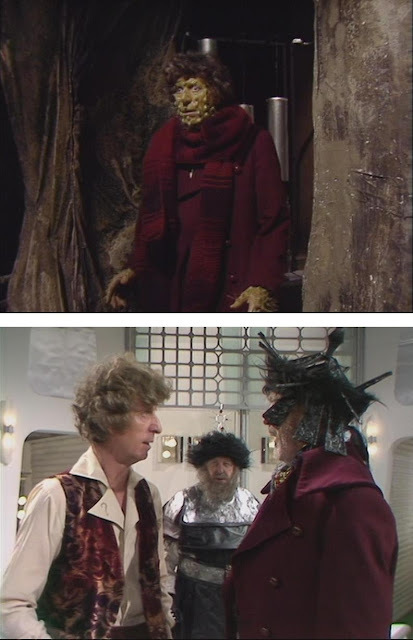 Meglos, after shapeshifting to impersonate the Doctor, somehow also creates a perfect copy of the Doctor’s clothes, without even knowing he wears a coat and scarf! Notice how Meglos wears the scarf tighter around the neck to disguise the bottom of the prosthetic face mask. For the second time running the serial opens with The Doctor wearing just the waistcoat and shirt without the greatcoat or scarf. 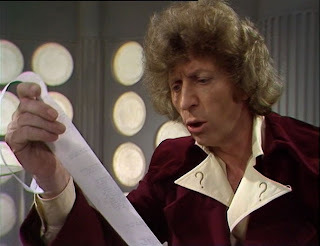 The burgundy corduroy breeches are still worn, but he now has the brown leather cuff boots first seen way back in The Deadly Assassin. The shirt worn is not the same as in The Leisure Hive or Meglos. If you look very closely at his left lapel there is a very small loop close to the tip (see left, top). This is so the shirt can be buttoned across the chest, which is never seen. The loop is definitely not present on the previous version (see screencaps with previous episodes). He is soon wearing his greatcoat and scarf to venture out of the TARDIS. By this point in production the oversized velvet collar of the coat is loosing its original roll-line and it starts to splay out, overhanging his shoulders. The TARDIS console room hatstand has some old favourites for us this time. In episode one we can see his new greatcoat and scarf, over his light brown Harris Tweed frock coat first seen in The Power Of Kroll and the inverness cape from The Talons Of Weng-Chiang. 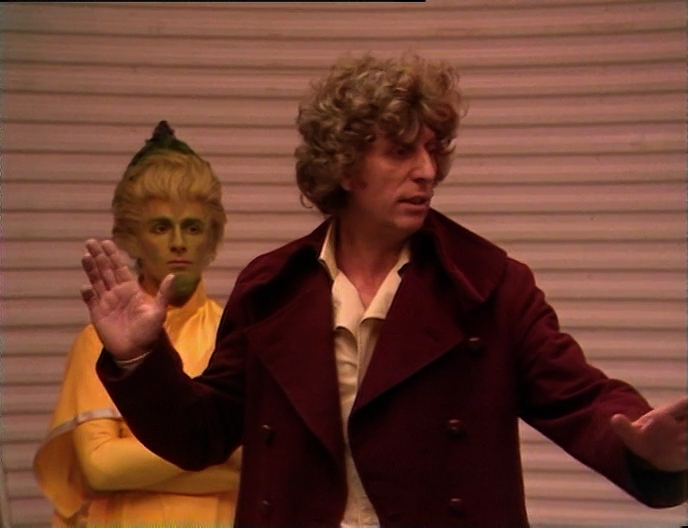 Later in episode four he returns the coat to the stand, giving us another flash of that luminous emerald lining. Finally, as the Doctor follows a trail of broken objects from the TARDIS, he chances upon his old paisley waistcoat in two pieces. This first appeared in The Power Of Kroll and was only seen a few times, most prominently in Nightmare Of Eden. This serial was the second to be recorded for season 18, so The Doctor returns to wearing the argyle socks and suede brogues first seen in The Leisure Hive. The new hat and Norfolk jacket are not seen at all, and The Doctor only wears his scarf while outside of the TARDIS (though a brief seen in episode one he does not wear it, see left, top), opting to keep it on the console room hatstand when back inside. Also on the hatstand are his old burgundy velvet frock coat and light brown Harris Tweed frock coat. 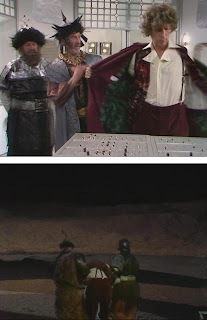 We can also clearly see the button loop again on the shirt lapel which wasn’t present in The Leisure Hive (see left). The Doctor has now permanently retired the golf socks and suede shoes in favour of his trusty old cuff boots. Aside from that, he continues to wear his revised getup from Meglos. For the first two episodes, he also has a red hankerchief with yellow spots tied around his hand as a make-shift bandage after it is hurt by time winds. 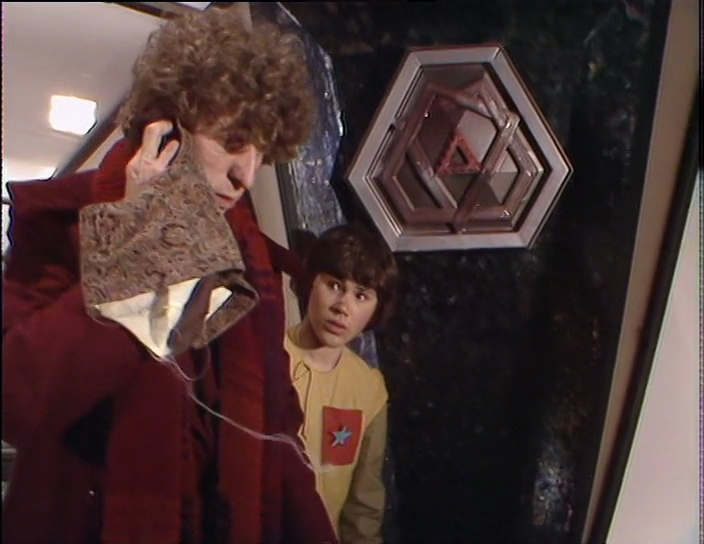 This serial features the only broadcast appearance of the Shada scarf during the Fourth Doctor’s reign, it being on the Tardis’ hatstand along with the light brown Harris Tweed frock and his burgundy felt fedora. This serial finally gives us a good look at the back of his greatcoat. You can see how the side seam is cut around towards the back, and it’s from this seams at the waistline that a half-belt emerges, with the two buttons connecting. As for the vent, we get a brief glimpse of buttons on the inside edge of it, suggesting that it can be buttoned like on the Tenth Doctor’s overcoat, both of which have their origins in military greatcoats. The Doctor costume is now pretty much settled, with some initial pieces have gone by the way side. The Norfolk jacket and fedora hat were only seen in The Leisure Hive and his argyle socks and suede brogues only made it as far as Meglos and State Of Decay before being replaced by his brown leather cuff boots. The opening scenes of this serial give us an excellent view of the button arrangement of the greatcoat. You can see how the line of buttons diverges towards the top, matching the large lapel shape (see left, top and second picture). To see how this works, it’s worth looking at the Costume Transition Scene for Sylvester McCoy, where he briefly dons the coat buttoned to the neck. 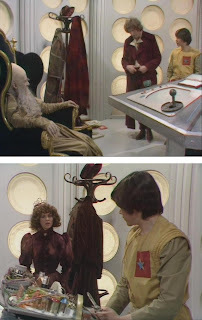 For technically the first time since The Talons of Weng-Chiang the Doctor actually buttons a coat he’s wearing, though just the bottom row (see left, bottom). This is the only time he wears the greatcoat buttoned in any way. This time the hatstand holds the chestnut-brown velvet frock coat and the tweed inverness cape, as well as the burgundy fedora and, while he’s in the TARDIS, the Season 18 scarf (see right). Finally, in the last scene of this serial The Doctor wears his waistcoat buttoned for the first time since season 15’s Underworld (see left). Until this point, The Doctor has worn his new Season 18 scarf in much the same way he did his previous Season 16 & 17 version: in one large loop, occasionally throwing the ends over one shoulder to prevent them dragging or getting in the way. In this serial his scarf has finally stretched enough that he wears it wrapped around his neck in two complete loops (see left, top). For studio scenes he wears his waistcoat unbuttoned, however for the outdoor filmed sequences he carries over from the last scene of The Keeper of Traken and wears it properly buttoned up. Also as in The Keeper of Traken, he’s occasionally seen to button his greatcoat, though only the bottom one or two rows. The greatcoat’s stunning emerald green lining was an after-thought between the location and studio recording of The Leisure Hive. Adding it at this stage would not have been easy, so only the two inside fronts were re-lined, leaving the back still sporting its original plain burgundy fabric. This deception was never seen until some running scenes in the last episode of this final serial. If you look closely you can see the tails of the coat is distinctly only half lined in green (see left, bottom). Now this series is concluded gents once again I have to congratulate you in one breath and beg for a PDF of the whole article in another. Would be a great addition to your sidebar and simply, easily, the most exhaustive guide ever compiled. Well done both!!! Been looking this up some and the white shirt (which is similar to 8's) is often called a "disco shirt." This seems to be the best way to find that oversized, pointed collar. In State of Decay, you can see the new plum Fedora folded and in his pocket, during some scenes in the tower.